County Garage of Taunton, Somerset. Homepage. This page: County Garage - Agents for Standard and Triumph cars in Somerset. County Garage (Taunton) Ltd, 1956. This is the second invoice made out to a Mr Leatherby, for work done on his Standard car in 1956 (this invoice describes work done at the nearby Colmans Garage in August & September of that year). Maybe he wasn't happy with the work done at Colmans, or simply decided that he'd entrust this latest piece of work to County Garage (Taunton) Ltd, an approved Standard & Triumph Agent. 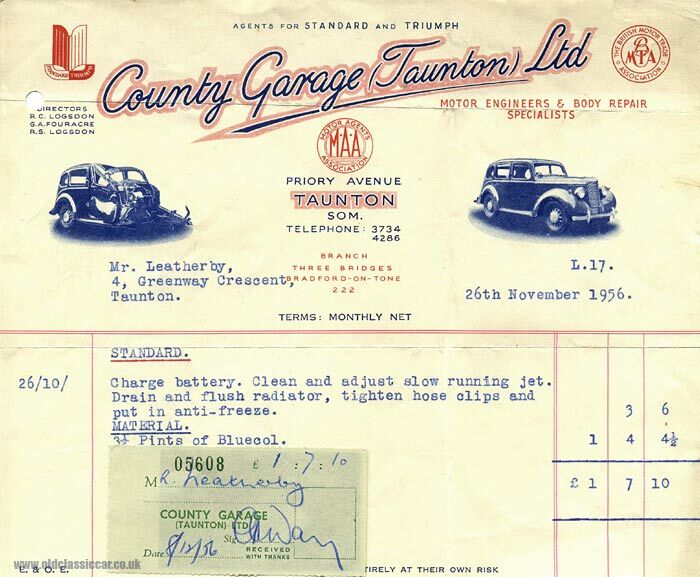 The invoice describes some winter preparation work that was undertaken on Mr Leatherby's Standard: a re-charge of the car's battery, carburettor adjustments, drain and flush of the radiator, followed by a fresh jug of Bluecol anti-freeze. County Garage was situated on the corner of Priory Avenue and Gyffarde Street in Taunton, and the three directors were P.C. Logsdon, G.A. Fouracre, and R.S. Logsdon. Despite being Standard Triumph dealers, their invoices actually featured a post-war Phase 1 Hillman Minx - before and after some significant accident repair work. They were members of the Motor Agents Association (MAA) and The British Motor Trade Association (BMTA). Sadly the garage building is no more. In 2004 an archaeological field survey was undertaken of the former County Garage site, prior to being re-developed by a housing firm. It seems that the garage site was at one time a medieval burial ground, with various skeletal remains uncovered. Does anyone have a photo showing the garage in use? Return to the Motoring Collectables section for more items relating to vintage and classic motorcars.